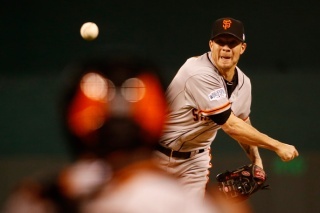 Clang-clang, goes Giants pitcher Jake Peavy's future bar. Somebody give this man a cable car. Jake Peavy is just a country boy. With, very soon, his very own San Francisco cable car to ply him with alcohol. The San Francisco Giants pitcher is in the process of purchasing an "authentic S.F. cable car" with the intention of turning the historic train into a "mobile bar" on his 5,000-acre ranch in Alabama, according to reports. TMZ reports that Peavy's brother, Luke, confirmed the plan for the cable bar. There's no timeline as to when the bar will be en route to Alabama, but TMZ says the Peavys are "super-charging the process to get it done ASAP." Which may be the fastest a cable car has ever traveled.